Paul Lebga Fonyonga taught about solar cookers at two events last year. The first was at a conference on youths and the environment (see photo), hosted in the capital city of Yaoundé. The second was in the provincial capital of Bamenda, during an international Islamic seminar on development. Longtime advocate Alison Curtis continues her work teaching solar cooking in Kenya. She has now spread the technology along the coast, to the north of Lamu. 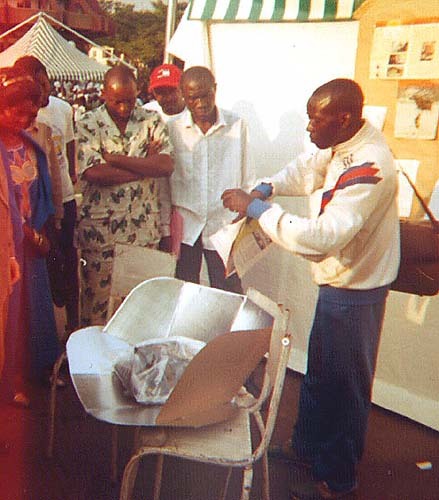 A solar cooking exhibition was held in Bamako, Mali last September. Nearly 400 people witnessed the solar cookers on display, including this one (see photo below), which reached temperatures of 300 F (150 C). Contact: Gnibouwa Diassana, WV, BP 26, Bla, Mali. When using a panel-type solar cooker (i.e. CooKit), some sort of clear plastic bag is often used surrounding the cooking pot, to create the desired greenhouse effects which result in sufficiently high temperatures. However, many plastics have a melting point lower than these temperatures, resulting in melted bags and reduced success. 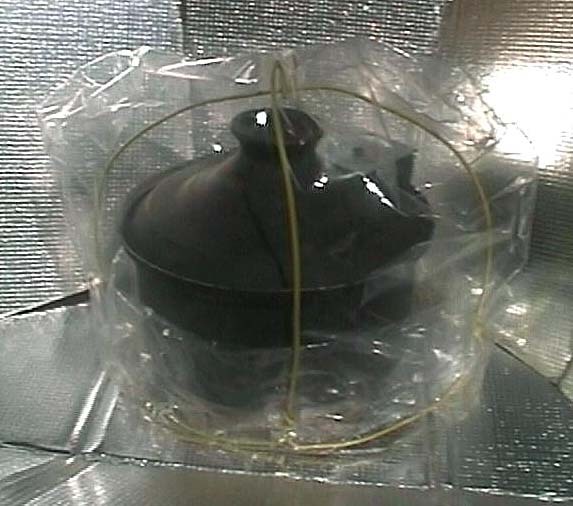 Based on an idea introduced by Gnibouwa Diassana in the August 2000 issue of Solar Cooker Review (and others in the past, including Chris Keavney), Wietske Jongbloed experimented with using a simple wire structure surrounding the pot, over which plastic can be slipped, forming a dome or "hat." Done carefully, this can greatly reduce the possibility of plastic touching the pot. Wietske found no significant difference in performance between this system and the more traditional system of placing the pot inside a heat-resistant bag. However, she noted that with some dishes excess condensation became a problem - water would form on the inside of the plastic, drip onto the foil surface of the CooKit, and run to the edges where cardboard is exposed and more easily damaged. Rosa Garcia Kirmse enjoys using her box cooker on the rooftop terrace of her home in Natural Park Cabo de Gata - Nijar. "In the morning I place in it the food to be cooked, when we arrive a few hours later from the beach ... the food is ready," she says. " We only have to prepare the salad!" Directions for making this type of cooker can be found in the Spanish book "Ingenios Solares" by Jose Manuel Jimenez. Contact: Rosa Garcia Kirmse, Alfonso XIII, 75 / Octava, Madrid (16), Spain. Maryknoll missionary Chris Keavney, who dedicated much of his five years in Peru to the spread of simple solar technologies like solar cookers and showers, ended his mission this past December. In his final newsletter, he reported on the success of the Peruvian National Solar Energy Conference held in November, 2000, in Puno. A number of solar cooking papers were presented, primarily focused on technical issues. Chris, along with associates Omar and Felix, presented a paper based on the results of a survey of their past solar cooking students. Earlier reports from Chris indicated that solar cookers continue to be used over time, but most often as a supplement to wood or dung fires, not as a replacement. He remains optimistic saying, "... at least we have given some people the ability to cook fresh bread and other good things more often than before, along with a practical appreciation of solar energy and what it can do for them." 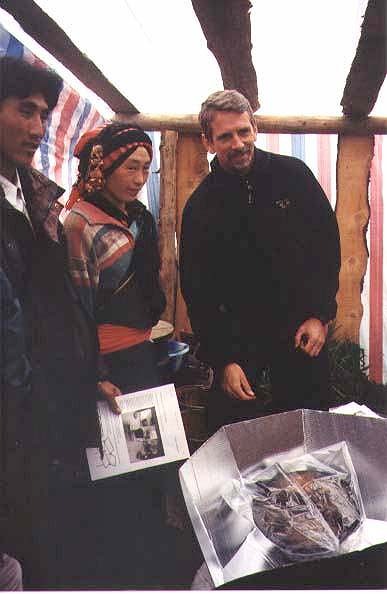 During a visit to the Aba Zhou Autonomous Region of the Sichuan Province, Rocky Rohwedder, Ph.D., conducted a workshop on CooKit usage for nomadic peoples of the Tibetan highlands. He left the cooker, as well as supplies and instructions for building more, upon his departure. Parkaire Engineering Company is now producing parabolic solar concentrators that can be used alone, or in series, to cook food or pasteurize water for groups of people. When used in series, the concentrators heat water, creating steam that can be utilized to cook food in large quantities. Contact: S. Parkash, Parkaire Engineering Company, D - 15/4, Okhla Industrial Area, Phase - II, New Delhi - 110 020, India. 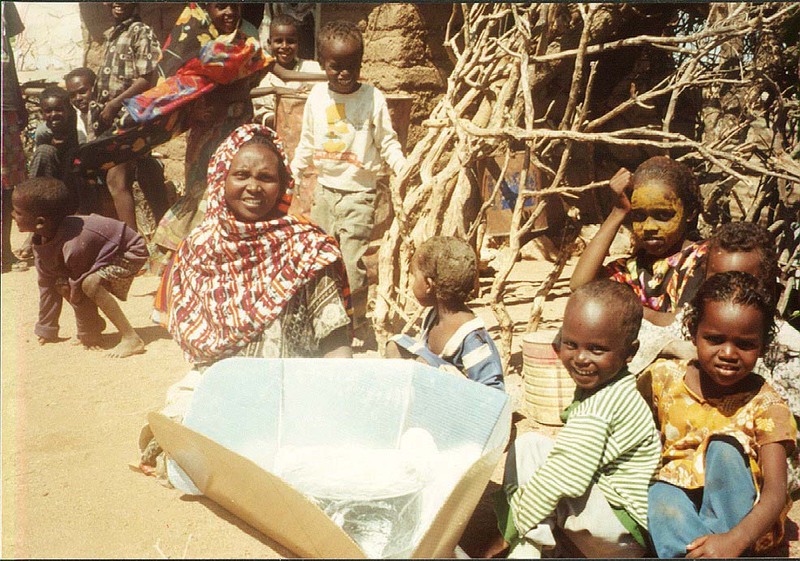 The following information is based on a five-country report by Rotarian Wilfred Pimentel, who, along with his wife Marie, has dedicated much of the last decade to creating enthusiasm for Rotary-sponsored solar cooking projects around the world. The report was compiled during their most recent trip to Africa. Wilfred and Nic, third and second from right respectively, stand among teachers and helpers of the newly-formed Mashila School, as noted on its first chalkboard. Local children, freed from much of their fuelwood gathering chores, are now becoming educated. 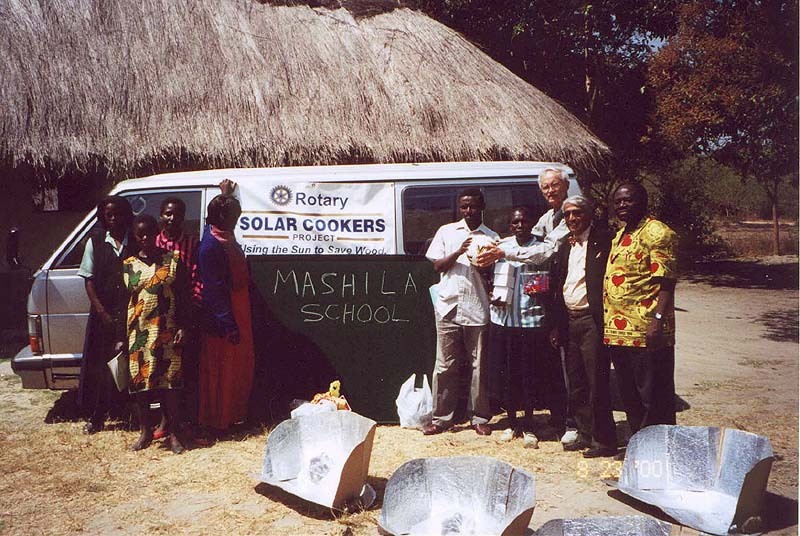 Rotarian Nic Money and the Rotary Club of Lusaka Central initiated a pilot study in 1999 in Chongwe, a nearby village, using the CooKit, a solar cooker made in-country. In this village, the Rotary Club selected an NGO, The Girl Guides Association of Zambia, to demonstrate and train the rural women in solar cooking and water pasteurization, and introduce them to the benefits of using a wonderbasket. (A wonderbasket, also known as a fireless cooker or "hay box", is an insulated enclosure in which is set a pot of food that has been brought to a boil, allowing it to continue to cook after being removed from its heat source. More info here) Women can make CooKits from cardboard and foil, and wonderbaskets from local baskets or a cardboard box well insulated with clean rags, dried grass, wood shavings, crumpled paper, cotton and blanket waste. The CooKit is a very effective supplement for fuelwood and an alternative to charcoal used for cooking foods and heating water to kill waterborne diseases including E. coli, cholera, polio, and hepatitis A. It reduces fuelwood expenses by 50 percent, improves health and nutrition, and saves the lives of infants. The pilot study also revealed the CooKit to reduce the long hours spent by mothers and children in their never-ending search for wood. This "free time", noted by Nic Money, sparked an idea to initiate the building of a school for 120 pre-primary and first grade students. Three villages are making 12,000 mud bricks to build a school, with solar cookers as payment to families making bricks. Meanwhile, the children are attending school in the small village courthouse. The Rotary Club of Lusaka Central was awarded a solar cooker matching grant from Rotary International to spread this pilot project in communities severely affected by deforestation, erosion and contaminated drinking water. Local Rotary clubs of Lusaka were approached to participate in this project by being offered options, i.e. adopt a village and promote solar cooking; donate CooKits and pots; sponsor a workshop; or assist in improving the durability and/or design of the CooKit with alternative materials. 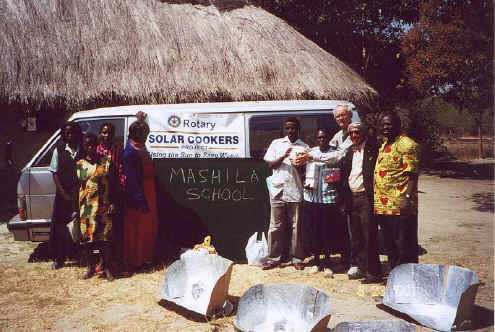 Another successful solar cooker project is supported by a matching grant awarded in February 2000 to the Rotary Club of Luanshya in the Copperbelt region of Zambia. Teachers in the secondary schools, with the cooperation of the officers of the Ministry of Agriculture and its health and home economics department, have trained extension workers to use the simple technology employed by the CooKit. They actively participate in workshops at schools, townships and villages of the Luanshya district, demonstrating the use and making of the CooKit. 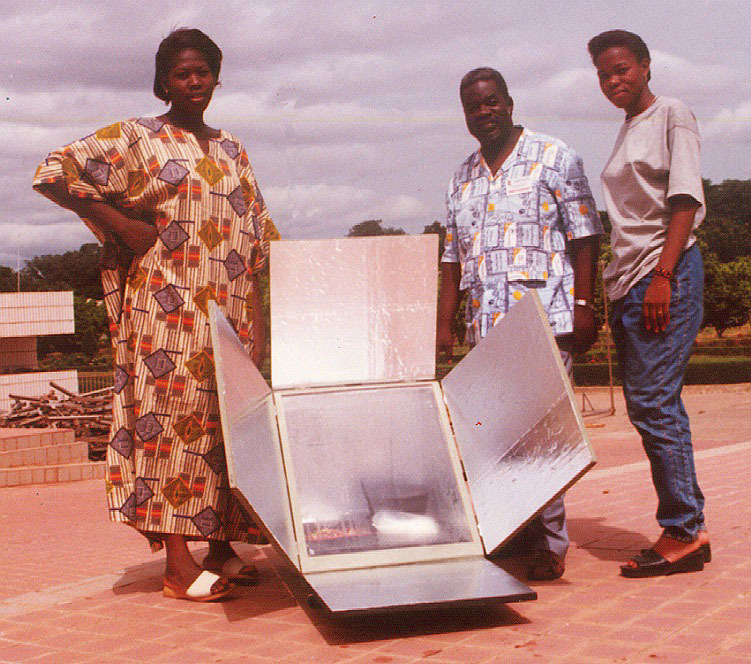 Solar cooking technology has been incorporated into programs such as farming, health, sanitation, and women/youth affairs. To date 300 solar cookers are in use. 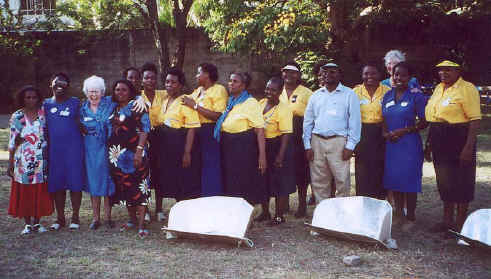 The Rotary Club of Bulawayo South continues to make newspaper headlines with its solar cooker project launched in 1998. We visited end users in the Ntabazinduna area where solar cookers are spreading. One cooker has been in use for four years. We interviewed a lady whose granddaughters had been with her and knew all about the CooKit from classes at school and wanted to use it, but grandmother prized it so much that she would not let them. Forty solar cooker trainers carry out bimonthly workshops and home visits. Approximately 200 CooKits are sold monthly. A total of 2,500 CooKits have been sold as of June 2000. In Plumtree, located 90 miles south of Bulawayo, three volunteer leaders and ten local trainers are implementing a solar cooker project. Women from the Girl Guides Association of Zimbabwe have also assisted, providing evaluations and assessments. CooKits are only sold to those who attend a workshop. The two widely separated communities surveyed boil their basic food, githeri (beans and dried corn), over fires which consume a lot of fuel and time. The CooKit provides a very suitable replacement. 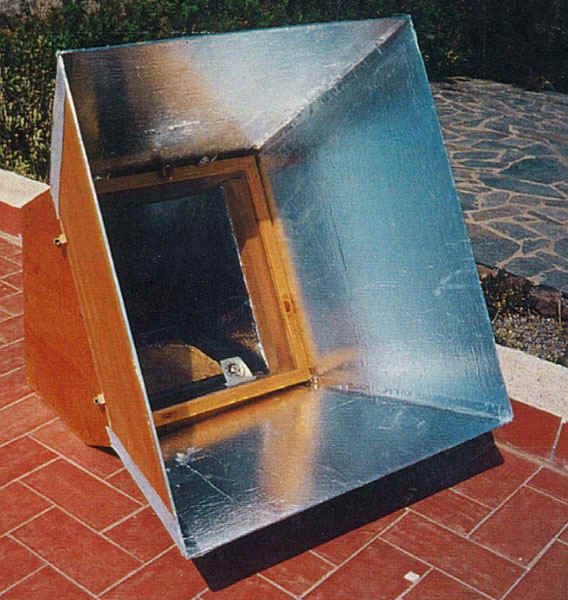 Solar radiation is perceived as a modern fuel, even though it cannot be used in rainy weather or at night and food cannot be as easily observed while solar cooking. CooKits are liked for being convenient, easy to use and safe around children; however, firewood is the major source of cooking fuel and in warming huts, but disliked for being smoky and unsafe. Not enough publicity and training workshops are given regarding benefits and availability of solar cookers in a community. Poverty, lack of food, and drought are the major problems faced by these communities. furniture, and commercial logging greatly contribute to environmental degradation with high deforestation and soil erosion. Over 90 percent of the population in Tanzania do not have access to electricity, and 80 percent of the population live in rural areas. The Rotary Clubs of Tanga and Mwanza will network with Rotary Clubs in Fresno (California, USA), and District 5230 will apply for a matching grant. Selected, as a local partner NGO, is the Tanzania 4H Organization with 11,000 members ages 8 to 18 years, 55 percent of them girls. Their advisors will be trained in the use of CooKits and responsible for workshops and visits to member's homes to promote and support its use in the home. A member of the Tanga Rotary club is the national director of the 4H organization, and will facilitate, monitor and evaluate the project. matching grant for solar cookers in Ghana is in process. There are two major problems adversely affecting the lives of Ghanaians: the acute shortage of fuelwood/charcoal for cooking and that 80 percent of the population drink and use water contaminated by Guinea worms and other waterborne diseases. The Tamale region, an agricultural area occupying one-third of Ghana, has a population of 1.8 million people who depend on fuelwood which is rapidly disappearing because of agricultural expansion and severe erosion. 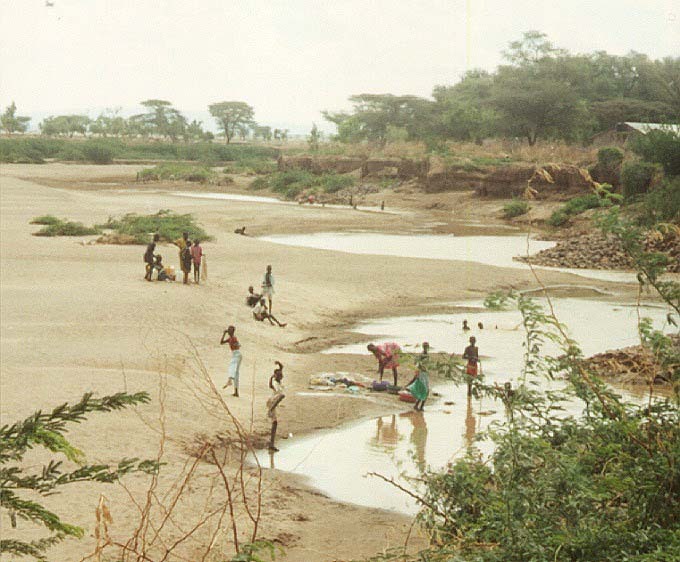 Guinea worm infection and waterborne diseases are endemic in this region, with 200,000 to 300,000 people at risk. The water flea or Cyclops found in ponds or reservoirs serve as host to the Guinea worm larvae where people bathe, launder and collect drinking water. In Tamale we demonstrated that a CooKit not only cooks food but heats a liter of water to 65º C (150º F), sufficient to kill the Guinea worm and other waterborne diseases! A recognized, local NGO, Community Partners in Health and Development (CPHD), linked to the Ministry of Health, will direct the proposed three-year matching grant using CooKits for solar cooking and pasteurizing contaminated drinking water. Wilfred notes that the most important lesson learned thus-far is the need to have a clearly defined promotion strategy. "Over the past two years, Solar Cooker Projects-Africa has stressed the importance of an integrated program using CooKits, wonderbaskets and fuel-efficient stoves (all made in-country) that fulfill the needs of the primary user, the woman. Every integrated solar cooker project must include an effective marketing program for all user groups." Mrs. Kadoro Awalle lives with two other women whose husbands have died and whose children have grown up and left. They are too old to search for fuelwood and have no income to buy it. The solar cooker has a dramatic impact in her life. She explains, "If I don't solar cook, I don't eat." Fortunately, there are many sunny days in Aisha refugee camp and she uses the solar cooker regularly. Mrs. Nurima Farah lost her legs in a train accident just after coming to Aisha from the fighting in Sudan. She now finds that solar cooking improves her life significantly, since, as in the case of Mrs. Awalle, she can't search for fuelwood and has no way to generate income to buy any. She has to depend on handouts from neighbors which may sometimes come and other times not. With the CooKit and the sun, she can count on preparing meals for herself and her young children. Mr. James Manyang Anok is an elder community leader in Kakuma refugee camp who lost his wife three years ago. Since his children are adults and have their own families, he is left to cook on his own, and finds the CooKit a big help. As he was not accustomed to preparing his own meals, he was worried when he had to do it on his own. "The CooKit," as he says, "makes cooking for myself much easier than I expected." Mrs. Layla Jama, a young mother in Aisha camp, happily reports that she is able to reduce her reliance on charcoal from two bags a month to one by solar cooking. In Kakuma camp, recent flooding washed away a water pump, leaving many sections of the camp without potable water. As a result, people started using CooKits to pasteurize water taken from other, less dependable water sources. Stories like these, of the real life benefits people realize through the use of solar cookers, keep us motivated. It is inspiring to see women (and some men) brave the risks of changing centuries-old attitudes and behaviors to reap new benefits for their families and neighbors. We are gratified to have, in just over a decade, spread solar cookers and training to more than 25,000 families in our Africa projects; to have educated and provided information to more than 4,000 individuals and organizations in developing countries; and to have assisted and communicated with more than 20,000 individuals and organizations in developed countries. We are able to play a central role in sharing experiences and information with the many committed individuals and organizations that make up the international solar cooking community. The need is ever rising. The world continues to lose 12 million hectares of trees per year. The share of the world's population in countries undergoing moderate or high water stress will likely rise from the current 33% to 66% by 2025. A similar deterioration in quality of water will accompany this reduction in quantity of water. At the same time, a multitude of organizations old and new are carrying out exciting new projects and activities within the field of solar cooking and water pasteurization. These factors present challenges to us - to keep abreast of changes and to figure out how to best support a wide range of efforts. The SCI board and staff recently carried out a strategic planning process. After looking at past performance, and taking into consideration organizational strengths and weaknesses, we turned to the future to identify how best to support the international solar cooking community - how best to broaden our reach and effectively support the spread of solar cooking and solar water pasteurization. Mrs. Awalle, Mrs. Farah, Mr. Anok and Mrs. Jama have gained much by learning to solar cook. Our purpose as an organization is to spread the benefits their stories represent. We have accomplished much, and see areas where, with additional resources and effort, we can significantly extend our reach. During the past thirteen years, SCI has emphasized different services at different times. We started with a focus on education , advocacy and information exchange, and have shifted towards the implementation of demonstration projects more recently. Over the next three years, we plan to move towards a more balanced integration of service activities to include management of SCI projects, technical support to other organizations, research, education, information exchange and advocacy. Through this effort to better balance and integrate our services, we will continuously grow our ability to learn as we go, in order to gather more useful material on what is and is not working well, and how to address any difficulties. As part of this effort we will stress the development of monitoring and evaluation procedures that will enhance our own, and many other, solar cooking and solar water pasteurization projects. We are developing a three year plan that will incorporate SCI's newly-sharpened mission and goals. By the next edition of the Review we will be able to share that plan in more detail. In the meantime, we welcome your suggestions about how SCI can best support the needs of the solar cooking community. Longtime solar cooker pioneers from different parts of the world met in October to share experience, enthusiasm and perspective. Mr. Javahar and Mrs. Aruna Maniar of Baroda, India, visited SCI's headquarters and exchanged views with SCI founders Barbara Kerr, Bob Metcalf and other SCI board members. 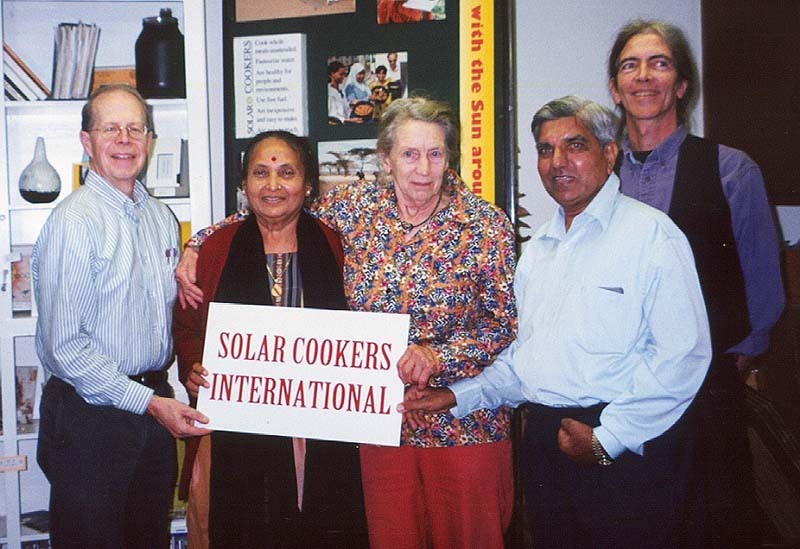 The Maniars have been involved with solar cookers for 20 years. They report that solar cooking is now the preferred method in Baroda, because people say the food tastes better than when cooked with gas. Solar cooking in Baroda is so popular, solar cookers are frequently given as wedding presents, while government agencies give solar cookers to schools. The success of solar cooking in Baroda comes from several factors. According to Javahar, a crucial factor is the quality of cookers. He and his associates upgraded the box cooker style then available in the Baroda area, with better sealing, better insulation, and two layers of glazing instead of one. They added small wheels to the box cookers to make them easier to move. A second factor was that the government of the state of Gujarat agreed to subsidize 50% of the cost consumers paid for cookers. Mr. Maniar credits Gujarat as being a "forward looking state" that realized the environmental benefits and economic stimulus that widespread solar cooking would bring. A third crucial factor was the Maniar's approach with their customers. In the early days, they say, they interviewed potential buyers and chose to sell cookers only to those they felt were most likely to make the effort to learn new solar cooking skills. Thus, solar cookers gained a good reputation from the start, not only because they were built well, but because they were used correctly by the customers. Once a person bought a solar cooker, the Maniars didn't stop there. Aruna's specialty was follow-up visits to make sure people were benefiting from their cookers. In addition to sharing tips and recipes, Aruna interviewed the customers, finding out what they liked and didn't like about solar cooking, their frequency of use, etc., and published the results to stir more local interest. She also compiled and published solar cookbooks, further spurring wide interest in Baroda for solar cooking. SCI leaders were struck by how the Maniars' experiences fit with SCI's. 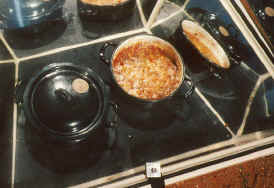 Just as the Maniars promoted solar cooking by demonstrating it at fairs and public events, by giving taste tests, etc., Barbara Kerr noted that "women all around the world seem to know that we need to solar cook for people, serve solar-cooked food, and thus arouse their interest in solar cooking." SCI advisor Bill Lankford was impressed by the Maniars' emphasis on following up with new purchasers of cookers. "Most people sell them and forget them," Bill lamented, while praising the "make sure customers get the benefit" approach the Maniars used to build their business. The Maniars have retired from their manufacturing and solar cooker businesses, but they continue to have a strong interest in helping solar cooking spread to other regions of the world. Javahar Maniar invites others in India or neighboring countries to contact him for advice about buying, building and disseminating solar cookers. Write to Javahar Maniar at: 39 Tagore Nagar, Old Padra Road, Baroda - 390 105, India; or at: Pin Ball Manufacturing Company, 147 G.I.D.C., Makappura Industrial Estate, Baroda - 390 010, India. A company called Tinytech Plants announces a program to help make the SK-14 type of parabolic solar cooker more available and affordable in more countries. The SK-14s are a popular type of cooker, but they often cost well in excess of US $100 each. The Tinytech company offers a program to provide the parts for 400 SK-14s shipped in a 20-foot cargo container, along with welding equipment and other necessary equipment. Tinytech says that when the container arrives at its destination, the company will send a technician to provide guidance in the manufacture of the first 50 solar cookers while training local people how to make the rest. After the initial 400 cookers are completed, only additional parts will be needed to make additional cookers. These materials may be available locally, or can be purchased from Tinytech. The total cost of the initial 400 cookers, including welding equipment and technician services, is US $30,000 - averaging $75 per unit plus local labor costs. Local production sites should have electric power available for the welding machinery. A searchable archive of past discussions can be found here. The following selections from recent e-mail discussions were compiled by group member Bob Culbertson. One lady liked the portability of her lightweight (cardboard) solar box cooker to take fishing, etc., and she did not want a wooden one. But, she had no room inside her home to store it. So, she built a waterproof wooden chest with a lid. It was big enough to hold her solar box cooker, and, by taking the wood lid off, she could cook with her solar box while it was in the chest. Yet she could pick out the cardboard portion and take it on her trips. According to a December 2000 CNN report by Greg Lefevre, man-made fires - including those for cooking - inhibit rainfall and can contribute to drought. A recent study conducted by Daniel Rosenfeld, a professor of meteorology at the Hebrew University of Jerusalem, indicates that clouds formed in dirty air produce "as little as half of the rainfall from clouds of the same size in clean air." Smoke particles in clouds cause smaller water droplets, which are slow to form into raindrops. Says Rosenfeld, "The major global environmental problem of the 21st century is water, the amount of the water and the quality. It is really a matter of famine or no famine." On January 10, 2001, I traveled north on a desert road towards Alexandria to visit El Sherouk Farm, a plantation located 72 kilometers from Cairo. I knew from my Swiss partners promoting solar cooking technologies, Annemarie Wenger-Marti and Alec Gagneux, that Egypt's first solar community kitchen had been completed five months earlier, when it was officially inaugurated by the Swiss Ambassador to Egypt. Finding myself back in Egypt for the second time, I was curious to see how this kitchen - used to cook meals for 300 people - functioned. Although I had trained hundreds of women to solar cook in Kenya, Ethiopia and Zimbabwe, I had only seen photographs of institutional solar kitchens such as this. January is the winter season in Egypt. Evenings are cool, but most days bring cloudless blue skies and pleasant temperatures. Solar cooking can be done here year round! Dr. Adel El Ghandour, one of the owners of El Sherouk Farm, organized my transportation from Cairo. El Sherouk Farm was built in 1995 on 6000 acres of land reclaimed from the desert. It is composed of lush plantations of fruit trees (mango, papaya, date palm, bananas, peach, orange, lemon), grapes, and exotic plants. Approximately 300 farm workers work on this plantation. Before installation of the solar community kitchen, management had to truck in bottled gas for the workers to cook their food with. Dr. El Ghandour stated that cooking was "much more convenient ever since Alec Gagneux completed the kitchen," and that the new kitchen was being used daily. Dr. El Ghandour took us on a tour. We walked through the "kitchen", a building composed of two rooms - one with dining space for about 100 people, a second with a sink, a traditional stove fueled with bottled gas (which was not in use), and two huge pots. The pots sat up on two-footed pedestals against the wall, each next to what looked like a porthole which opened to the outside. The cook picked the lid up off one pot to show us that the beans were boiling. We exited through the back door onto a cemented patio where two parabolic reflectors, each measuring approximately nine feet in diameter, were sitting. 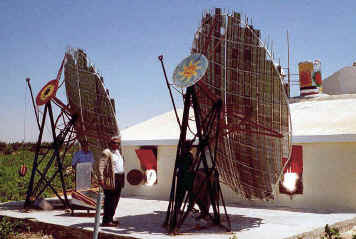 Solar radiation reflected off these parabolic discs onto the pots, through the portholes, providing the cooking "fuel". Each reflector is composed of over 100 mirrors, attached with twisted wire and fixed to a large frame. All materials were purchased locally. The total cost per unit was US $1000. Dr. El Ghandour paid for the materials plus a portion of Alec Gagneux's honorarium, a clear indication of his willingness to invest in renewable energy. He is a true solar pioneer! From the outside patio we could see the pots through the portholes. The solar reflection on each pot looked similar to fire. The temperatures were so hot that paper immediately caught fire when placed at the focal point. Cooking time is equivalent to traditional fire cooking. Both solar reflectors are equipped with a tracking system in order to follow the sun's rays; one mechanical, the other solar (photovoltaic powered). The beans in one pot had finished cooking, so Dr. El Ghandour shut the thick cement porthole to "turn off" the solar fuel and explained that now the solar radiation would be conducted up to the rooftop where a 250-liter barrel of water would be heated up. This water could be used later to wash dishes or make tea. Additionally, a special heat storage cover was produced for the pots to reduce the heat loss of the food for those who came to eat later in the evening. Siemens Solar donated a photovoltaic solar system which was installed to provide light and make the kitchen more attractive in the evenings, especially when visitors come. After our visit, Dr. El Ghandour invited us to his office. He explained his wish to introduce a totally integrated energy system at El Sherouk and that the next step would be making biogas from waste. The Minister of Agriculture had sent agronomists to visit El Sherouk to assess the possibility of replicating it elsewhere, such as in the Toshka Project, southwest of Luxor, where the Egyptian government hopes to reclaim farmland from the desert. On this second trip to Egypt I realized that most every part of the country offered a perfect climate for solar cooking, with perhaps the exception of Cairo where air pollution might hinder success. Visiting El Sherouk's solar community kitchen was one of the highlights of my trip to Egypt. I reported back to both Alec Gagneux and Annemarie Wenger-Marti to congratulate them on their important contribution. In this Review, let's talk about a way in which you can gift highly appreciated assets by way of a Charitable Remainder Trust (CRT) to Solar Cookers International. Even though the stock market is down from its highs, most long-term investors have enjoyed substantial capital gains - not just in the stock market but in tangible assets like property and collectibles - over the past two decades. By making a gift to the CRT, you receive an income tax deduction at the time the trust is funded. Your highly appreciated assets are usually sold, and then placed in a diversified investment portfolio. There are no capital gains paid on the sale so the full fair market value of the assets will keep working for you and your family. Typically, donors and their families are the income beneficiaries of the trusts and can receive income from the trust for either their lifetimes or a specified number of years. In addition, the CRT is not taxed so your assets will work harder and grow faster. (Income, as received by the donor, will be taxed.) At the end of the trust term, Solar Cookers International will receive the remaining principal to use for its charitable purposes. As an example, suppose you have $50,000 of IBM stock that you acquired years ago for $10,000. If you sell the stock now you have to pay tax on the gain of $40,000. Using a 20 percent capital gains tax rate, you need to pay $8,000 to the government leaving you with $42,000. On the other hand, you could gift the stock to a CRT, sell the IBM stock and reinvest the proceeds into a diversified investment portfolio (saving the $8,000) and collect income from the entire $50,000 trust annually - and receive a $50,000 charitable deduction! Solar Cookers International would receive the balance of the asset at the end of the trust term. In many cases, a well-designed life insurance program funded by the charitable deduction savings can provide the cash needed to replace the asset gifted to Solar Cookers International. Depending on the size of the gift, a number of investment firms can offer case design as well as trust drafting and administration. 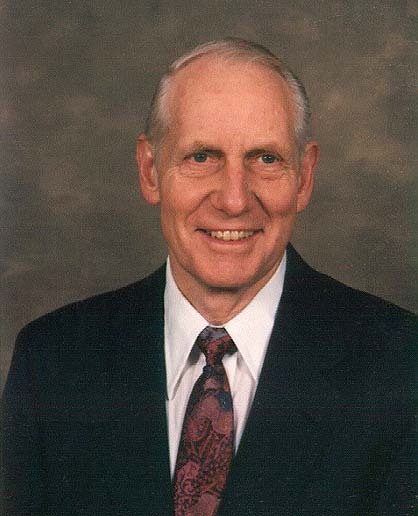 Fred Rogers, Certified Financial Planner and investment advisor, may be contacted at 916-485-3473 or toll free 877-299-8080. We periodically receive questions about solar cooking and eye safety. An eye specialist has explained to us that individuals exposed to direct or highly-reflected sunlight for long periods of time, such as sailors and fisherman, have an increased risk of developing cataracts as a result of receiving excess amounts of UV radiation. Most users of solar cookers, especially panel- and box-type cookers, spend relatively little time in the sun since food needs only be placed in the cooker and left, usually without any stirring, until finished. Also, the intensity of sunlight reflected by these types of cookers is somewhat less than that of direct sunlight. Certain curved concentrator-type cookers (parabolics) are of a little more concern since they are designed to multiply available solar radiation. And given the higher temperatures reached, stirring of the food is often required, resulting in more time spent near the cooker. With a little common sense, however, solar cookers can be used and enjoyed safely. Below are some tips, sent in by Howard Boldt, for reducing the amount of sunlight that reaches your eyes while solar cooking. If you have any expertise in eye safety, or have any experiences to share, please contact Mr. Boldt and the SCI office. when inserting or removing food, place your body between the sun and the cooker, creating a shadow across the reflective area. Alternatively, rotate the cooker away from the sun briefly. when available, opt for a cooker with a device - such as rod on which the pot slides or a "swing arm" on which the pot sits - to allow for pot access without having to lean over the cooker. use the cooker in a fenced area to prevent unwanted access. Alternatively, the cooker may be raised on a platform or used on a rooftop if feasible. if children will be in the vicinity, explain to them not to stare at the glare. Constantly sitting in airplanes or airports for the two-day trip from La Paz, Bolivia, to South Africa was tough on my half-century body, but the thrill of meeting and learning from so many of the good folks I had corresponded with or read about made that physical sacrifice worthwhile. The Johannesburg airport was charged with excitement as the shuttle filled to take us to the Kimberly flight. Within minutes I saw someone I knew! Darwin Curtis of Solar Household Energy (SHE), just off a flight from Washington, D.C. He presented me to a friendly African woman, Margaret Owino, Solar Cookers International's East Africa representative. Folks all around were making introductions or becoming reacquainted from previous encounters, and from that Kimberly flight on, we ate, slept and talked solar cookers for the next five days. It is hard to evaluate which was of greater value - the three-day Second International Conference on Solar Cooking, or the participant networking. Truthfully, I would have preferred an increased emphasis on solar cookers during the plenary sessions. However, the assistance this conference provided so many of the African participants must be recognized and valued. In reality, food preparation and household energy are related and it is certain that many participants received the edifying, educational information they came for. A primary focus of the conference was the solar cooker pilot program conducted by the German technical organization GTZ. Within this program I was surprised to see such an emphasis on technological improvements, while the human elements, including training and follow-up, seemed vague. It was evident and disappointing to me that in most of the cooker projects presented, little attention is being placed on the study of solar cooker usage rates and habits that bolster or hinder their use. This practical aspect needs to be addressed. Another area of focus in future conferences should be the inclusion of complementary cooking systems, such as retained-heat cookers and efficient wood cookers, as part of a holistic approach to reinforce solar cooker use. Many participants were surprised by Margaret's solar-cooked rice. Using a simple CooKit, she created a quick and tasty dish, without having to stand over the pot and stir. It was quite a contrast to the fancy, more costly parabolic and flat plate cookers. It is amazing that so many participants had never witnessed the effectiveness of this nifty device. Margaret also scored big with the solar carol she taught us. Since the conference proceedings will be out soon, I urge all to acquire a copy. Not only will you learn an entertaining carol, but you will be able to evaluate and utilize a valuable contribution to the field of solar cooking. Thanks South Africa, for the excitement, education, and great hospitality. Solar Cooker Review is published two or three times per year, with the purpose of presenting solar cooking information from around the world. Topics include solar cooker technology, dissemination strategies, educational materials, and cultural and social adaptations. From time to time we cover related topics such as women's issues, wood shortages, health, nutrition, air pollution, climatic changes, and the environment. 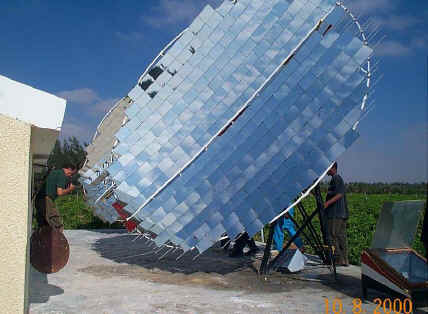 Solar Cooker Review is sent to those who contribute money or news about solar cooking projects. The suggested subscription price is US $10/year. Single copies are sent free to select libraries and groups overseas. 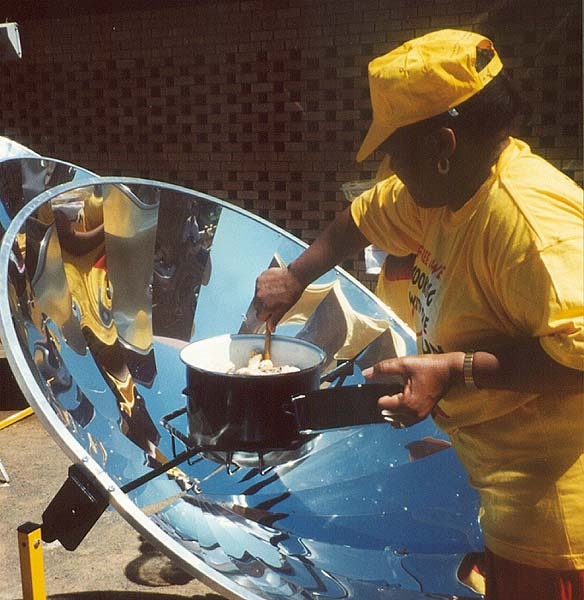 We welcome reports and commentary related to solar cooking for possible inclusion. These may be edited for clarity or space. Please cite sources whenever possible. We will credit your contribution. Send contributions to Solar Cookers International, 1919 21st Street, Suite 101, Sacramento, California 95811-6827, USA. You may also send them by fax: 916-455-4498, or email: info@solarcookers.org. Solar Cooker Review is compiled and edited by the staff of Solar Cookers International, with layout graciously provided by IMPACT Publications located in Medford, Oregon, USA. SCI is a 501(c)(3) nonprofit organization whose mission is to spread solar cooking to benefit people and environments worldwide.